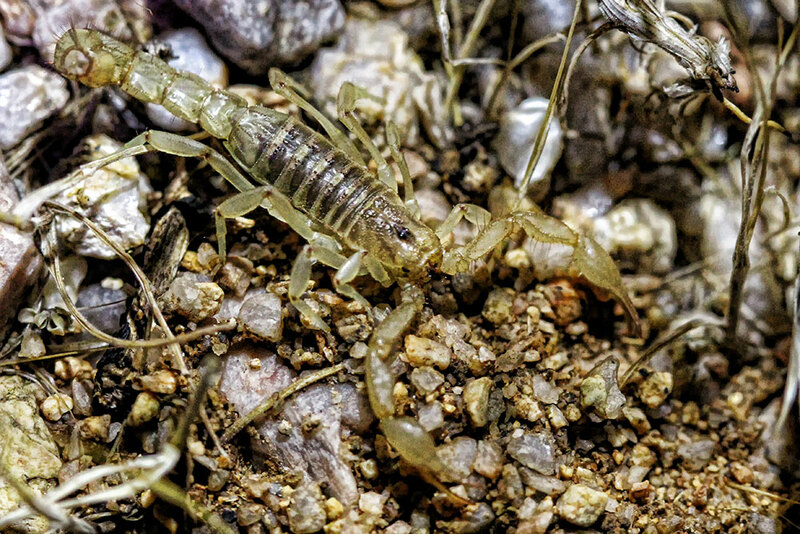 I’m in the desert creeping slowly along a hiking trail intent on tracking down a famous desert dweller – scorpions! 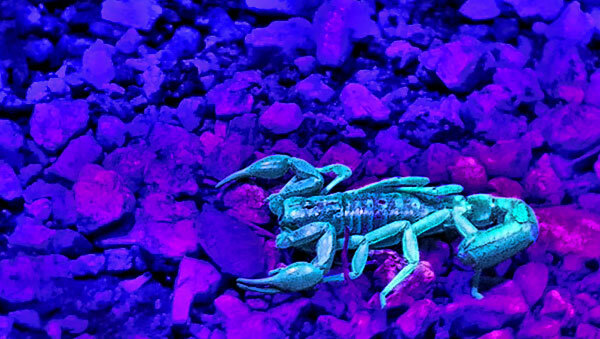 Armed only with a black-light to hunt with I headed out on a desert safari at one of the local national parks. The desert is seemingly barren during daylight, but once night falls there is an ominous atmosphere. On this night cloud are blocking the moonlight and we’re shrouded in darkness. A pack of coyotes are heard howling nearby. Even though we’re inside park boundaries this is an unsettling wilderness that raises your alertness to lookout for dangers. I’m here to witness a unique phenomenon in the animal kingdom. 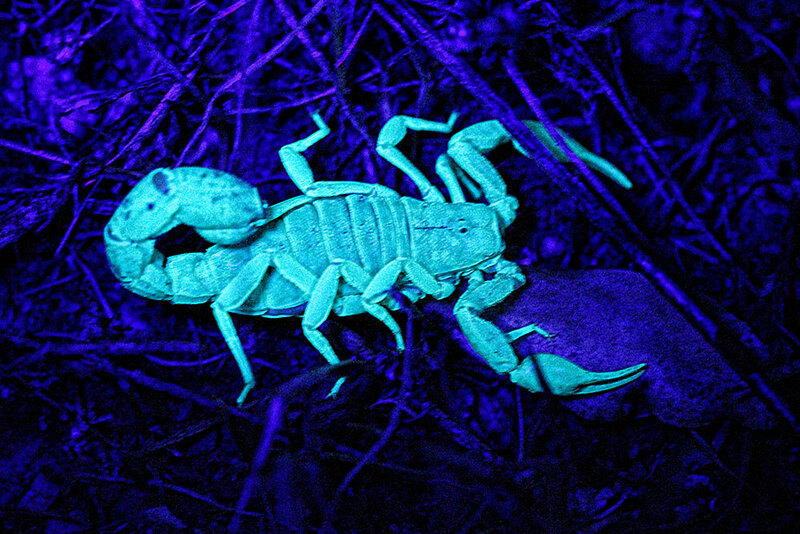 Scorpion’s bodies light up and glow brightly under ultraviolet (UV) light. These critters are elusive and excellently camouflaged to the naked eye; you’d have a very hard time spotting a single one under with normal lighting at night. With our technological advantage it didn’t take long before our first 8-legged friend was found. The first one was easily spotted from roughly 10 feet and glowing brightly near a large bush. 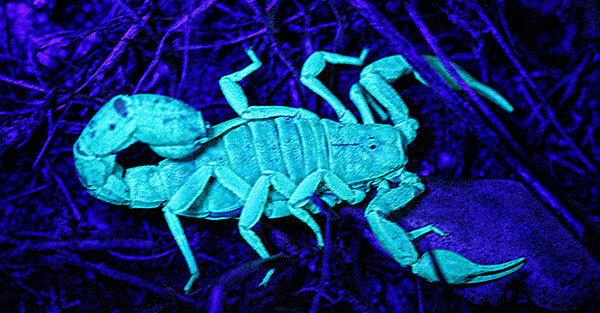 Scorpions glow under the UV light due to fluorescent chemicals in their bodies. Scientists have hypothesized theories as to why they’ve evolved this way but the verdict is still out. As we approached the scorpion remained still and didn’t attempt to evade nor sting us. Within an hour on the trail we’d found more than a dozen scorpions of varying sizes and species. 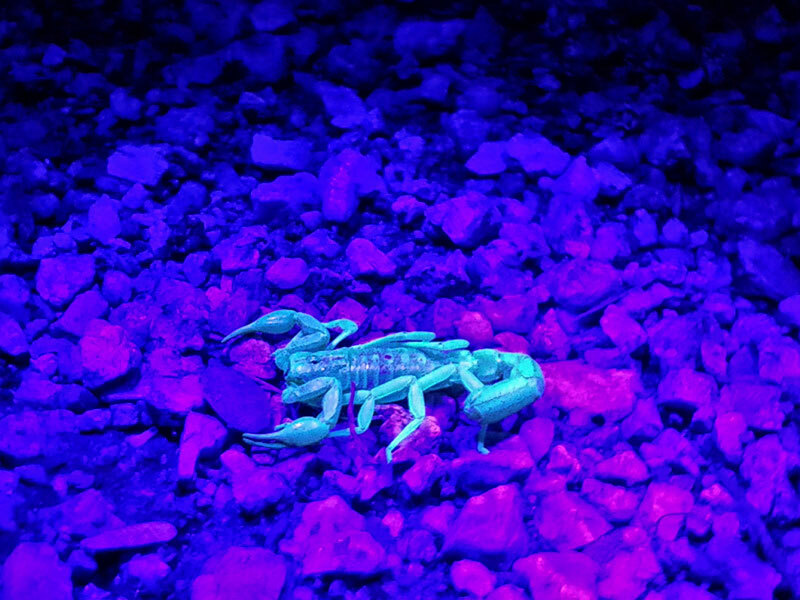 Arizona’s deserts (and sometimes urban homes) have more than 40 species of scorpions in them. 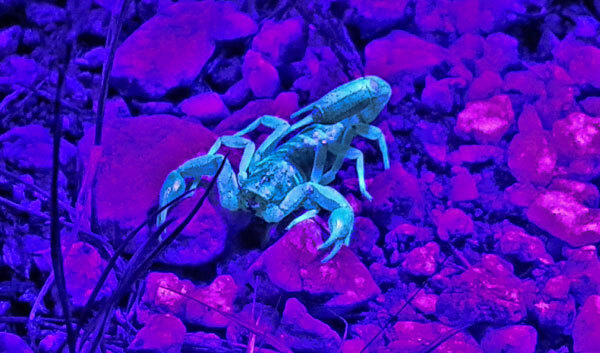 3 of the most common are the giant hairy scorpion (the largest scorpion in North America), the stripe-tailed scorpion, and the most dangerous of all – the Arizona bark scorpion. Although stings are venomous and painful there haven’t been any reported deaths for decades. Below is another photo taken with the UV light off and the camera flash on. It blends so well into the surroundings that it was hard to find without the help of the glow. After the group had satisfied their appetite for glowing creatures we began the journey back to the visitors center. I flipped on a normal flashlight curious what I’d find along the way. It didn’t take long before I spotted something running quickly along the desert floor. 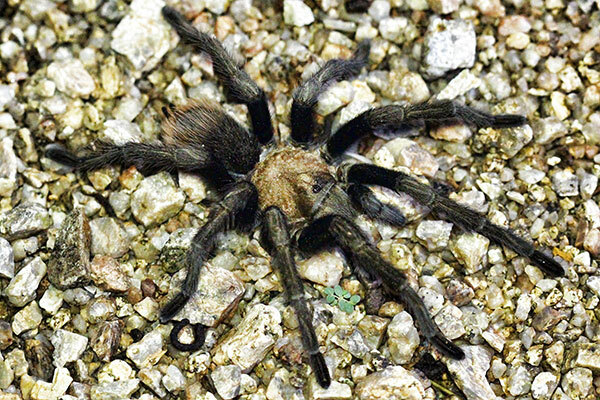 At first it appeared to be a small rodent.. then it stopped in its tracks to reveal itself – a large hairy tarantula! As the group approached it darted into a hole and we never got a close look. Luckily for us the park ranger had the scoop on where a more cooperative spider might be lurking. We were taken to it’s burrow where it laid in wait for prey, 2 legs barely visible peaking through the entry. Wiggling and twisting a piece of grass at the burrow’s opening tricked it and out it sprung like a bullet out of a gun! Side Note: If you love weird animals check this out! Scorpion Safari – Where to go on one? 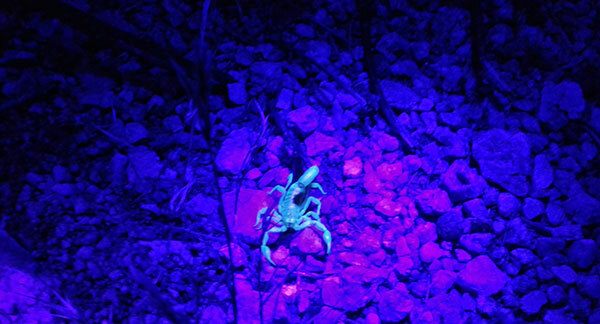 Scorpions are widespread and common throughout the desert here. If you’re brave enough to walk around alone all you need is a cheap UV light and your adventurous spirit. If you’d like to go on an organized tour with an expert the local Arizona parks are a good choice. They hold events throughout the summer that are free other than the $6.00 park entry fee for vehicles. You can see a list of scheduled and upcoming events here.